The National Association of Home Builders/Wells Fargo builder sentiment index, slipped to 53 this month, down two points from 55 in February. It’s the third monthly decline in a row for the index. Readings above 50 indicate more builders view sales conditions as good, however. Construction of new homes plummeted in February, as fierce winter weather froze housing starts in the Northeast and Midwest. The Commerce Department says builders started construction at a seasonally adjusted annual rate of 897,000 homes in February, a steep 17 per cent plunge from January. Housing starts slid 56.5 per cent in the Northeast and 37 per cent in the Midwest. 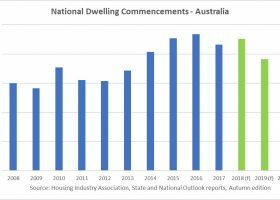 Recent job growth, low mortgage rates and cheaper petrol have yet to unleash spending by consumers on big ticket items such as housing. Consumers appear to be paying down debt, instead. Builders expect a sharp increase in renters to hit the market. Approved building permits rose 3 per cent to an annual rate of 1.09 million, with apartments accounting for the entire gain and offsetting a decrease in permits for single-family houses. Labor shortages, a dearth of available land parcels cleared for new home construction and tougher mortgage-lending standards weighed on builders’ confidence this month, said David Crowe, the builder group’s chief economist. “These obstacles notwithstanding, we are expecting solid gains in the housing market this year, buoyed by sustained job growth, low mortgage interest rates and pent-up demand,” Crowe added. Despite the increasingly favourable economy, home sales have been sluggish so far this year after a lacklustre 2014. Sales of new US homes were basically flat in January, slipping 0.2 per cent from the previous month to a seasonally adjusted annual rate of 481,000. Sales climbed 5.3 per cent from a year earlier, when harsh winter weather caused home-buying to stall. Still, lower mortgage rates and job gains over the past year are among the factors pointing to stronger sales this spring buying season, traditionally the peak period for home sales. Mortgage rates remain near historic lows. The average 30-year fixed mortgage rate was 3.86 per cent last week, according to the mortgage giant Freddie Mac. A year ago it stood at 4.37 per cent. The latest NAHB index was based on responses from 346 builders.